Everything went smooth. It couldn’t have gone better. All three airlines came in on time and the buses pulled out of the airport right on schedule. After our ride up to Galilee we had dinner all prepared at our Kibbutz hotel right on the shores of Galilee. Now everyone is heading to bed and some are having a drink or walking down to the sea of Galilee. This video will give you an idea of how everything went on our first day. Thanks to Bishop Cistone for bringing his diocese and for trusting us to guide them. This is a grand celebration of the 75th anniversary of the Saginaw Diocese. By the way, a point of interesting trivia: the Diocese of Saginaw Michigan is 7,000 square miles; all of Israel is only 8,000 square miles! Great second day of our pilgrimage. Climbing the mountain of Transfiguration (cheated by using taxi cabs :-), renewing marriage vows in Cana, authentic Nazareth lunch and visiting the cave where the Word became flesh. 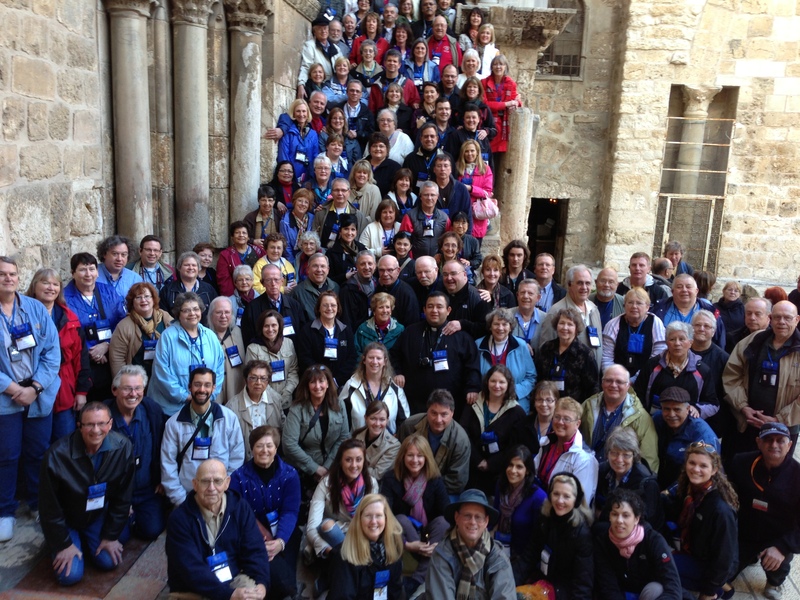 Enjoy the videos of the Saginaw Diocese pilgrimage to the Holy Land Day 2. This was our second full day on the Saginaw Michigan Holy Land Pilgrimage with Bishop Joseph Cistone. We are all celebrating the 75th Anniversary of the Diocese of Saginaw. We are also traveling through the Holy Land at the very same time a new pope is being elected in Rome and we are praying daily for the Cardinals to be led by the Holy Spirit in their deliberations. Today was exceptionally exciting since we visited two major sites related to the calling and appointment of St. Peter. First, Caesarea Philippi where Jesus named him and appointed him the Rock foundation of the Church and gave him the Keys of the Kingdom. How appropriate considering the events going on in Rome. We also visited the shore of Galilee where Jesus appointed Peter the shepherd of his flock and told him to feed (teach) and to tend (govern) his sheep. We also had Mass at the Mount of Beatitudes, drove through the Golan Heights where we saw Lebanon and Syria and the road on which Paul traveled to Damascus before his conversion. Two sites along the Sea of Galilee where Jesus multiplied the loaves and fish (and yes, it was a miracle!) and where he appointed Peter as his shepherd. Everyone is doing well and the three buses are moving as one — always on time, punctual and full of excitement, adventure, prayer and devotion. Bishop Cistone is a delight in every way. He is a great shepherd, joyful, kind and a pleasure to be with along this pilgrimage. You can listen to the Bishop’s homily at the Mount of Beatitudes HERE for the time being. Yes, it is already Day 4 and the pilgrimage is 1/2 over – very sad, that! It was beautiful weather and the group stayed together with great grace and style. We have been ahead of schedule throughout the trip. Bishop Cistone and his priests have been marvelous! The homilies are inspiring and insightful. The Saginaw Diocese is blessed by God by such a humble yet wise and strong leader. Today we had Mass Capernaum where Jesus lived, and where he said, “Eat My Flesh and Drink My Blood.” What an amazing thing to eat the Eucharist where Jesus proclaimed its meaning and power. The boat ride from our hotel to Capernaum across the Sea of Galilee was loved by everyone. After a great lunch of St. Peter’s Fish, the same fish Jesus ate, we drove south UP to Jerusalem. One never goes “down” to Jerusalem since this city is the place where God dwells and is therefore the highest place on the earth! One the way we stopped at the Church of the Visitation where Mary met her relative Elizabeth — after she walked over 90 miles to get there. I gave my empassioned talk on Mary explaining how she is the Ark of the New Covenant and the Queen of Heaven. After praying the Mystery of the Visitation we drove the the Notre Dame Hotel where we settled in, had a great dinner, set up confessions for everyone and all went to sleep to rest up for a full day in Bethlehem tomorrow. Bishop Cistone’s Homily HERE for the time being. Today was exciting and every moment we were ahead of schedule! This is a great group and they love every minute of our adventures today – especially the dancing! Shopping started the day. Most groups go shopping almost every day but we limit it so that we have more time to visit holy sites and pray. But we shop only at Christian shops to support the oppressed local Christians in the Holy Land. Afterwards we went to the Church of the Nativity to touch the place Jesus was born. A local lunch at the Christmas Tree Restaurant of falafels and schwarma filled everyone’s tummy quite well before heading for Shepherds Field. This is where David tended his father’s sheep and we think he wrote the 23rd Psalm. We had Mass in the cave where the shepherds were staying. Then to a marvelous Palestinian meal of roast lamb stuffed with spiced rice, lentil soup, many salads, traditional sweets and Turkish coffee. Then the Arabic music began and everyone jumped up and danced. Then back through the checkpoint to our Notre Dame hotel. What a day. Bishop Cistone’s Homily at Shepherd’s field HERE. Magnificent day! Great pilgrims – ahead of schedule the whole way. We had a solemn entry with pipe organs and singing Franciscans as we entered the Tomb of Chris, then we had an audience with the Bishop of Jerusalem. Listen to Bishop Cistone’s profound homily in the garden HERE. I always tell people that they will thank me later 🙂 and they do. We got a wake up call today at 4:00 AM to leave for the Via Dolorosa, touching the top of Calvary and High Mass at the Tomb of Christ. We get up early because the streets are empty and the can pray and stay together as a group more easily. See the progression? Carrying our crosses along the Stations of the Cross arriving at the place of crucifixion. We all touch the top of Calvary (many with tears in their eyes) and then have the Solemn High Mass at the Tomb with the Franciscans and their magnificent pipe organ. Then breakfast. St. Ann’s Church to visit the birthplace of Mary and the Miracle of Jesus in John 5 where he healed the cripple at the Pools of Bethesda. Also, visit to pray at the Western (Wailing) Wall and lunch at Notre Dame. There was a BarMitzvah at the Wall which everyone got to see. The afternoon was free but a lot of folks took a walk around the Walls of the Old City of Jerusalem, went to the Holy Shroud Exhibit and much more. Bishop Cistone’s Final Homily found HERE. Comments and Farewells from our Pilgrimage; Is it Safe to Travel to Israel? I thought you would enjoy comments from the pilgrims and our farewells. One of the questions addressed repeatedly was the safety of a pilgrimage to Israel.